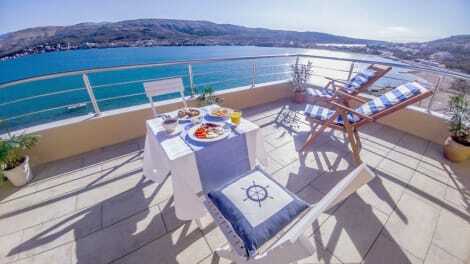 Located in Pag, Hotel Plaža is by the sea, a 3-minute drive from Museum of Salt and 8 minutes from St. Mary’s Church. This 4-star hotel is 14.4 mi (23.2 km) from Zrce Beach and 29.5 mi (47.5 km) from Kvarner Gulf. Enjoy a meal at the restaurant or snacks in the coffee shop/café. The guesthouse also offers room service (during limited hours). Meet other guests and eat at the complimentary reception. A complimentary buffet breakfast is served daily from 8 AM to 10 AM. Make yourself at home in one of the 10 air-conditioned rooms featuring refrigerators. Rooms have private balconies. Complimentary wireless Internet access is available to keep you connected. Private bathrooms with showers feature complimentary toiletries and hair dryers. Enjoy a satisfying meal at Restaurant Smokva serving guests of Hotel Park Smokva. Wrap up your day with a drink at the bar/lounge. A complimentary buffet breakfast is served daily from 8 AM to 10 AM. The guest do really enjoy their holidays at this property facing a beautiful view of Velebit Mountain and marine channel Paska Vrata. This apartment complex is located in the town of Pag, a favourite destination for many travellers. The property is located at the walking distance from a beautiful beach. Set in a peaceful and quiet surroundings are an ideal setting for those seeking a relaxed holiday. The town centre is also at walking distance. Guests can choose among 6 well-equipped accommodation units each tastefully fitted. All units come with a kitchen and private bathroom and a balcony. Bed linen and towels are provided free of charge. Guest can also take advantage of a parking place (one per apartment) available free of charge. lastminute.com has a fantastic range of hotels in Pag, with everything from cheap hotels to luxurious five star accommodation available. We like to live up to our last minute name so remember you can book any one of our excellent Pag hotels up until midnight and stay the same night.